For about a month, all over Facebook back-to-school pictures have been taken and exclaimed over. Mommy blogs (and a few Daddy blogs) have written about the emotions tied in with that first day. I wrote my own mandatory back-to-school post last week. 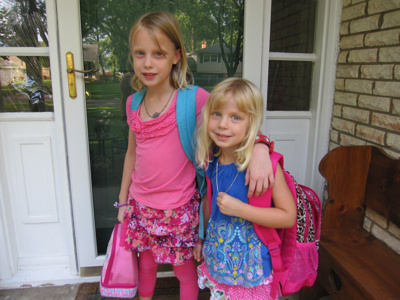 Lily and Emmy are pictured wearing their backpacks, loaded up with school supplies, a lunch and a snack, ready to go. For Emmy, Kindergarten has really been no big deal. She has been in preschool since she was three and has been well prepped to start school. When I was three, there was no preschool in the town I lived in. I didn’t go to school until I was five years old, and then I went to Kindergarten. Emmy goes to school all day; I just went to school in the morning. Emmy has math in the morning, and gym class, and after lunch she has reading. I had nap time; our teacher would dim the lights and we would lie down on our little rugs and pretend to close our eyes. Despite the less rigorous Kindergarten I attended, I did quite well in school. In fact, I must have liked school a lot since I went on to become a teacher myself. Way back in Kindergarten, though, all I wanted to do was lose my two front teeth, just like my friend Dawn did after putting the handle of her plastic book bag into her mouth. And I did NOT want the teacher to take my jump rope! One day, I had decided to bring my brand-new jump rope to school. It was raining that day, so we had recess in the gym. The gym had wooden floors and a stage on one wall. Recess included many grades, not just the kindergartners. Kids would be running around playing tag; basketballs and kick balls would be flying through the air. With all the distractions, I soon abandoned my jump rope and let some other kids play with it. The sixth grade teacher saw that these kids were misbehaving with MY jump rope, and so he took it away from them. I saw what was happening, ran over to the sixth grade teacher and grabbed my jump rope right out of his hands. I told him that it was MY JUMP ROPE and my mommy told me not to lose it! My mother always got a kick out of telling me that story. After learning all of the Letter People (for some reason it is Mister M that sticks out in memory), it was time for me to move on up to First Grade. After a year of watching me go to school and wanting to go too, my sister eagerly started Kindergarten. 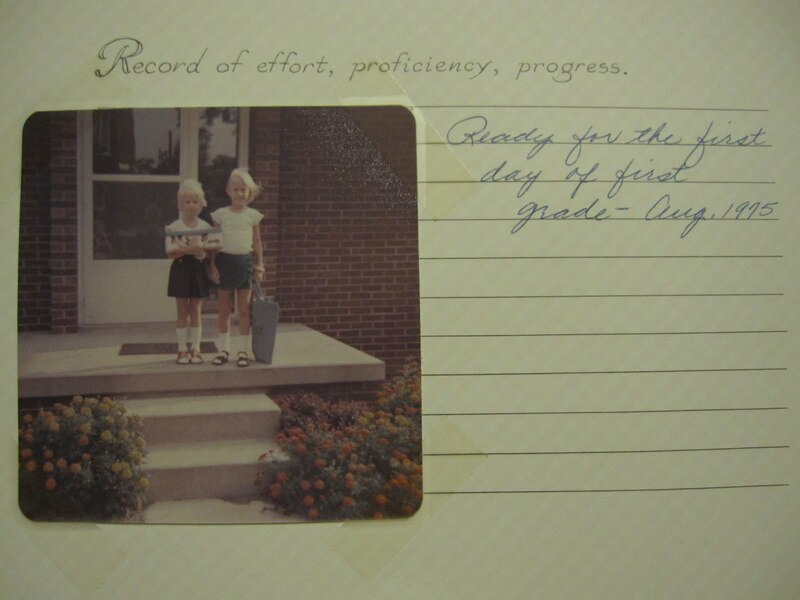 There was no Facebook, no blogging or Instagram or digital cameras back then, but Mom still proudly posted our First Day of School picture. My sister, going to Kindergarten, and me, ready for First Grade. And that, my friends, was the beginning of my formal Education. What do you remember about your school days? She is adorable! I bet she's going to be famous in her new school! Best wishes for this new period! wonderful photos & memories. I hope your girls have a fabulous year! Thank you, Stacey! I hope you're doing well! I love that your mother took and picture and saved it. Nothing beats actual photos and actual handwriting! I know! I'm so glad I have it. It's actually in my baby book, which goes up to third grade or something like that! I don't necessarily remember this, but my mother got a call on the first day of school from my flustered kindergarten teacher because I wouldn't respond to Jennifer and kept yelling that my name was Jenny. She loves telling that story. That is an awesome story! So, do you think there's a little bit of you in Sprite? I bet there is! I don't actually remember the whole jumprope incident. My mom told me the story so many times, it just feels like I remember! Oh I love it. I love that your mom documented it as you said back then there was no facebook /blogging/twitter and all the other media out there. Sadly I don't have really any pictures of me during school funny because my oldest cousin who treated me like his little sister was the one who had a a little album of pictures of me and gave it to me when I graduated HS I was so happy because basically are the only pictures I have. i think that is why I am am making sure to document as much as i can of my children's childhood sure I might be though of as the mamarizzi but that is OK because when they grow they will see it was for a very good reason Thanks for stopping by my blog! . Happy Saturday Sharefeast! Hey stranger! I'm still keeping up with you through my reader even though I feel off the blogging planet. I may be back some day. The girls are so big (and adorable!) Loved hearing your jump rope story and am glad the girls are loving school. Graham is doing great in kindergarten and Elliot is a year behind him in pre-k. Time flies, no? My recent post Happy Happy! I don't remember my first day of kindergarten, but I did have my picture taken by my cousin Charlotte. Yes, that's right, my first day of school picture was taken by my cousin, not my mom. Charlotte was staying with us because my mom was in the hospital. She had just had surgery to remove her thyroid, which had been deemed cancerous. And so began my mom's 30+ year battle with various forms of cancer. You go, Mom! Kick that cancer in the keister! Wow, what long battle she's had! Glad she's still with us! Ginny…I didn't attend preschool either, and don't have many memories of kindergarten. I do remember having a nightmare in first grade though, and my mom heard me saying "My lunch box doesn't fit…" in my sleep! 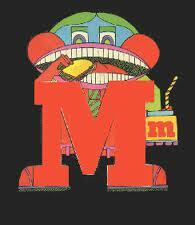 Your "Mr. M" reminds me of a Sesame Street episode that I found hilarious….you can find it on You Tube…..It is a "Law and Order" style mystery of finding the Letter "M". 🙂 Cute pic, BTW! I love your gumption with the jump rope! So cool! I surprised myself when I remembered them, and then was amazed that I found pictures! I always did think they were weird. Taking Turbo to kindergarten sparked memories for me–mine was a full day private school because the public schools where we lived were less than stellar. I enjoyed school and vividly remember learning the phonics sounds. I went to a small private school, too. I loved it! Phonics was definitely the thing, and education has gone back to teaching phonics at most schools, thank goodness! Love your childhood picture of you and your sister. Pre-school was just not the thing back in the day. I could have used it! Isn't that interesting how things change? Preschool probably would have been good for me, too! My recent post Coffee Friday that is Lick the Bowl Good! Yes, I'm so glad I have my mom's memories, too! I remember being in Kindergarten and then first and second grade. All those classes were right next to each other. So, when I started third grade, my Mum went straight to the class next to second grade. Fortunately I knew better, since that class was actually sixth grade! Where I eventually made it a few years later. My recent post On the lookout! That's a cute story! I'm sure you were proud of yourself for being able to tell your mum where to go! SO SWEET! I love the picture and I love your mother's beautiful handwriting! Isn't it funny the things we remember? I love Mr. M. Great spin! Thank you! I've always loved my mom's handwriting! I always wanted to write like her, but handwriting was not my best subject.